Quiet music to calm the heart in a noisy world. CDs, MP3s and sheet music. 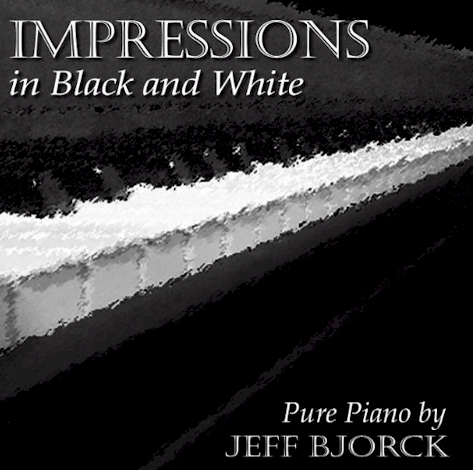 The stories behind Jeff Bjorck’s solo piano creations are frequently personal, often nostalgic, and always true. Below, you can learn about the development and history regarding each of his six CD projects, which span almost twenty years. 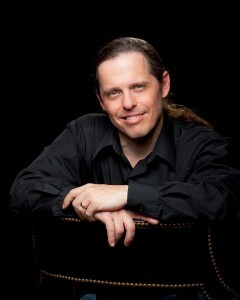 Jeff’s original compositions predominate on the first three CDs. On his fourth and fifth CD, Bjorck brought his unique approach to arrangements of classic hymns and carols, respectively. Most recently, his sixth CD features a return to predominantly original compositions. “It’s been quite an amazing and wonderful journey,” Bjorck remarks, “and not one that I could have ever anticipated.” Ever wonder what inspires a musician to compose a certain melody or arrange a particular classic? You can have those questions answered here. Read on! His song titles poignantly suggest encounters with beloved memorabilia such as Grandad’s rocker, Nana’s music box, and Mother’s hymnal. “Some of these pieces, like ‘Justine of County Clare,’ are particularly sentimental for me,” Bjorck remarks, noting that his grandmother, Justine Avita Mitchell, grew up in County Clare, Ireland, but died two years before he was born. “I never met her, but my mother told me stories about her mother’s life before moving to America,” he explains. “I grew up wishing I had known her.” Another personal title for Jeff is “Playing Catch with Dad,” a musical reflection of the times he tossed a baseball with his father in the street in front of their home. He remembers this as one of his favorite boyhood activities. In addition to his 12 original tunes, Bjorck presents his own arrangement of an old Swedish hymn that also reminds him of his early years. For stories behind each piece, CLICK HERE. To hear this CD, click here. We all love the melodies of Christmas. With each passing year, however, the heartwarming sounds of our childhood carols are increasingly drowned out by the noise of cash registers and commercials. Each autumn the neon signs on every corner blinking “XMAS SALE!” seem switched on earlier than the year before—the meaning of Christmas relegated (again) to an even smaller space in society. Jeff Bjorck’s fifth Pure Piano CD, The Wondrous Gift, is his somewhat about-face response to these forward-marching materialistic trends. He takes you back to a simpler time, when the term “Merry Christmas” was still considered a warm greeting. The classic carols featured on this CD will bring listeners floods of memories. 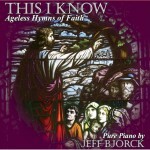 As he did on his last CD, This I Know: Ageless Hymns of Faith, Jeff brings unique interpretative arrangements to each of the dozen selections while making sure to pay tribute to the original melodies. Although recorded in 2010, many of the selections he’s been playing for years. Jeff loves them all, and each has story to tell. The sonic results provide listeners with music suitable for many occasions, from intimate holiday gatherings to Sunday morning preludes to personal times of nostalgic reflection. One particularly happy outcome was that Jeff’s favorite carol, “O Holy Night,” was the overwhelming favorite among those polled. 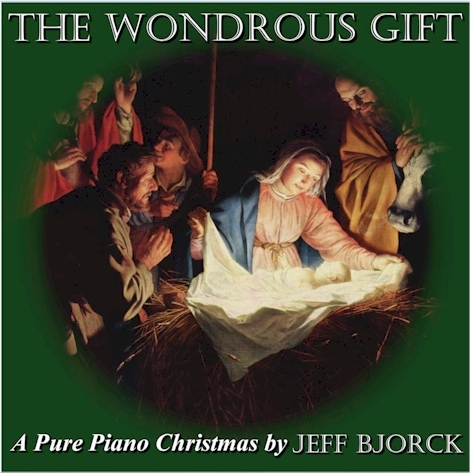 Whereas many arrangements of this piece tend to transform it into a rousing anthem, Jeff’s arrangement preserves the quiet peace and awe doubtless felt by Mary, Joseph, and the shepherds on that first Christmas Eve. Other selections, such as “Coventry Carol” create a space for sadness when loved ones are no longer present to celebrate Christmas with us. Still others, such as “O Come All Ye Faithful” and “Come, Thou Long-Expected Jesus,” reflect the exuberant anticipation experienced by so many at this time of year. The re-released six tracks from earlier CDs were recorded between 1995 and 2005, as were “Tis So Sweet To Trust In Jesus,” “It Is Well With My Soul,” and “Jesus Loves Me.” The remaining six new pieces were recorded in 2007. 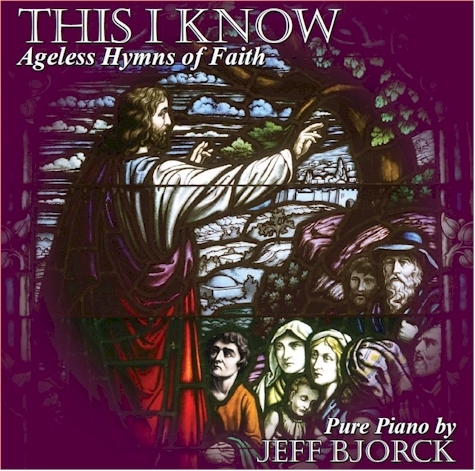 This I Know provides more of Jeff’s signature quiet music to calm the heart in a noisy world. A number of the arrangements can also be enjoyed with the volume turned up–way up–reflecting their heritage as rousing anthems. While developing these pieces, Jeff became aware of musical influences planted during his childhood that reemerged as he played. “Our church pianist was a student of Rudy Atwood, renowned accompanist for Charles E. Fuller’s Old Fashioned Revival Hour radio broadcast. Mr. Atwood even came and played at our church once when I was a boy. As I composed these hymns, I was surprised to hear hints of his style in my own playing. It is no small coincidence that I would grow up to become a professor at the seminary founded by Charles Fuller. That’s quite an interesting full circle!” Fittingly, this CD is being released in the very same year that Fuller Seminary celebrates its 60th birthday. 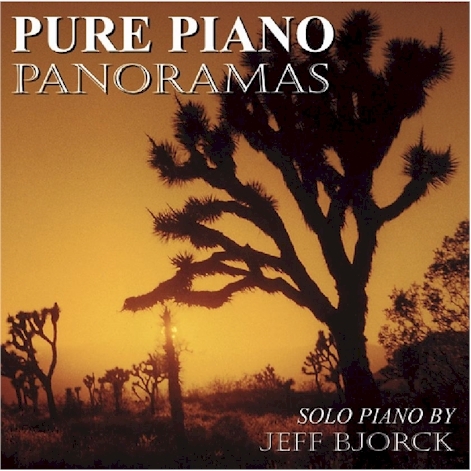 Many listeners asked for more background for Jeff’s compositions, so on this CD, he complies. In fact, Bjorck encourages the listener to read the liner notes, containing the stories behind each piece, before and/or during listening. 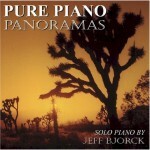 Jeff Bjorck’s second CD, Pure Piano Panoramas begins where his debut project Pure Piano Portraits ends. 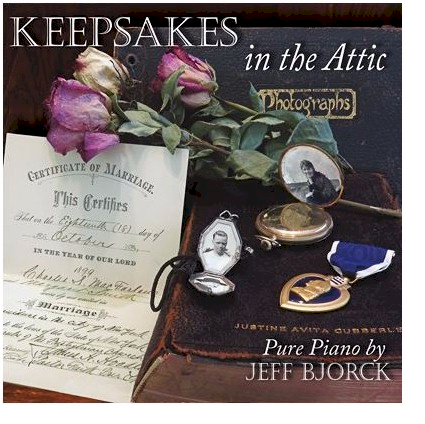 Many pieces on Jeff Bjorck’s first CD reflect his love for the Appalachian woods and Catskill Mountains of his youth. Now, having lived the last decade in Southern California, he has turned to the desert and chaparral for inspiration. From the Joshua Trees of the Mojave Desert (portrayed on the CD cover) to towering thunderclouds hovering above parched earth, Jeff’s new songs take the listener on a panoramic tour. These new pieces were all recorded in 2000. Most were composed over the previous four years, with two exceptions: “Day Without A Sun” was created in 1977, the year that Jeff lost his only uncle to cancer; “Your Love Has Made Me Fly “is a 1986 tribute to Sharon, Jeff’s wife (and best friend) of ten years. Their first joint effort at songwriting, “Sculptor of the Sky”, reflects their shared amazement with the beauty of clouds. Several other pieces also convey personal themes. Jeff honors his grandmother, who almost lived to see her hundredth birthday and a new millennium, with “Remembering Grandma”. An avid hang glider pilot, Jeff’s love of flight is manifested in “Soaring Mesa Cliffs”, which beckons the listener to rise high above the mundane into clear, stark, silent skies. 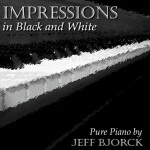 Since its release date several years ago, Jeff Bjorck’s debut CD, Pure Piano Portraits, continues to be a top seller at Amazon.com’s Indie Music-New Age-Piano section. It has also received airplay on select radio programs across the country and continues to do so. 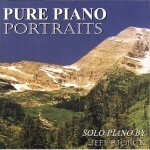 As Jeff’s first effort, Pure Piano Portraits features compositions from a wide variety of points along his personal time line. The included selections were all recorded between 1993 and 1995, but their creation spans twenty years. For example, both Can’t Say How I Feel and Catskill Mountain Meadow were originally composed in 1977. Many of the pieces on Portraits emerged in rough form during his days in graduate school, where a baby grand piano in the dormitory across from his office at the University of Delaware provided many welcome study breaks. On one such occasion in 1985, given his preference for spontaneous composition, Jeff brought an inexpensive cassette tape recorder with him. His plan was to “catch anything good that accidentally occurred.” The recorder was simply plopped on a pillow on the floor near the piano. Given the cheap equipment (! ), the surprisingly good fidelity of the recordings startled Jeff, and he risked playing his tapes for some friends. It was then that people first mistakenly mistook his music for George Winston’s. There are still a few people who are the (proud?) owners of copies of those early tapes! Formal recording of his earlier work did not begin until 1995, when as part of a small church with many musicians, Jeff was invited to contribute a track to a promotional tape. It was then that he first entered a studio and recorded Living Waters, with much help and moral support from friend and engineer/producer Bill Pearson of Mindseye Productions. 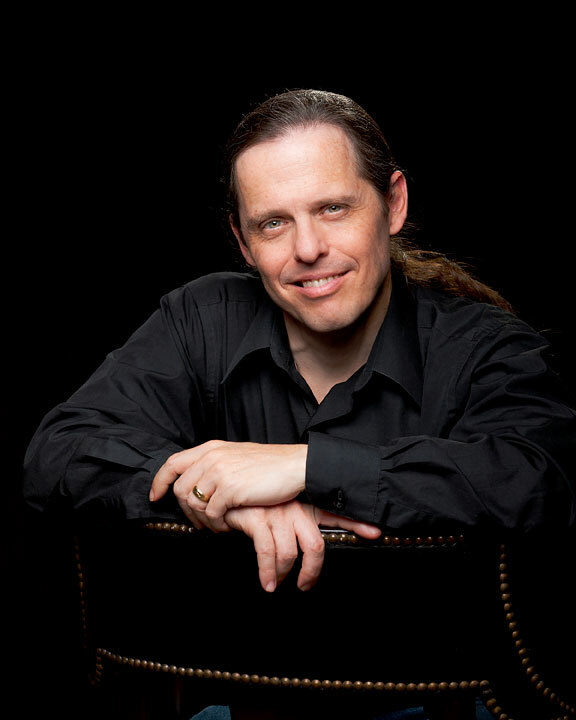 Having experienced the recording studio, Jeff was bitten by the “red light fever” bug, and the idea of recording more of his compositions “for friends and family” inspired him to polish up many of the pieces he had composed since his early teens. 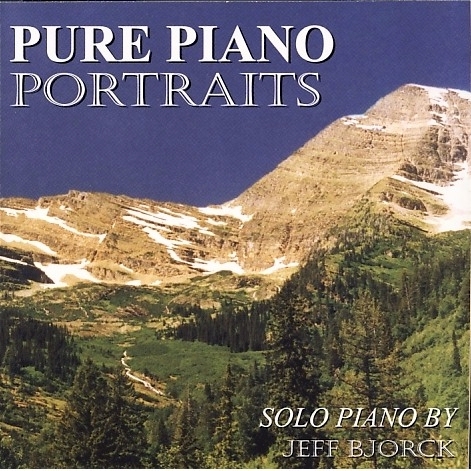 Once again with the invaluable assistance of Bill Pearson, Jeff returned to the studio and recorded a variety of works, including each track found on Pure Piano Portraits. When friends heard this commercial CD, the frequent response was “I’d love a copy of that!” Unfortunately, the required “license” fee to obtain a copy was considerably more than what one pays for the typical CD. Thus, Jeff returned to Gene Ort and requested permission to re-release his music as a retail CD. Gene graciously agreed, and Jeff proceeded to create Pure Piano Portraits.